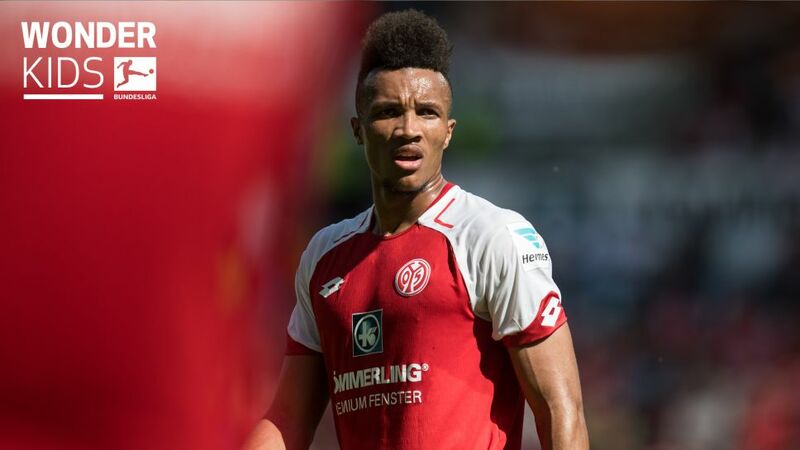 Jean-Philippe Gbamin has taken to life in the Mainz engine room like a duck to water. Jean-Philippe Gbamin was described as "a typical Mainz signing" when he arrived last summer with little fanfare, and the athletic midfielder has proven the club's description right by hitting his stride in his maiden season in Germany. Mainz sporting director Rouven Schröder, who had helped orchestrate the "typical" 05er deal by convincing Gbamin — formerly at French club Lens — the OPEL ARENA was best-suited for him to take the next step in his career, also added the club were "convinced of his ability." While those words sound like the everyday platitudes of a club towards a player they have just signed to a five-year deal, Mainz fans saw throughout the 2016/17 campaign that Schröder's speech had more to it than mere marketing. For his part, Gbamin had talked of "taking the next step" and avowed a burning, lofty ambition. "I want to make a breakthrough. Preferably immediately," he had stated boldly. They too could have been empty words, but his ability on the pitch gave them substance. His linguistic shortcomings have not been translated onto the pitch, however, where not only did he brilliantly vindicate Mainz's choice of him, but also his choice of them. "I'll pay attention to the style of play and how much time I'll get on the pitch," Gbamin had said during the 2015/16 season when speculation arose his Lens' story would soon be written in the past tense. "There's no point in leaving to sit on the substitute's bench. I need to play." Play he did. Assisted in his ambitions by injuries to Danny Latza and Andre Ramalho, Gbamin was immediately thrown in at the deep end in the Matchday 1 encounter with Borussia Dortmund, the first of 21 starts and 25 appearances in his maiden season in Germany. It was a case of sink or swim, and Gbamin ploughed forward with the assuredness and unstoppable momentum of an Olympic freestyler. That he was unfazed by the prospect of featuring in such exalted company stems from the fact he had already made 91 senior professional appearances, including 33 in Ligue 1, for Lens before moving to Germany. Indeed, Gbamin had made his debut with the northern French outfit before his 18th birthday. "Jean-Philippe is only 21, but has already built up a lot of experience at the top level," said an admiring Martin Schmidt, his coach last season. "You can see that in him." His raw ability shone through too as it has always done since he moved from the Paris region to the homely countryside of northern France with his mother, whose partner had a farm cosseted in a quiet corner of the Pas-de-Calais. "He arrived from the Paris region, we didn't even know if he'd played football before signing with us," said Dany Penne, the ten-year-old Gbamin's coach at his village club Union sportive de Saint-Quentin Blessy. "You could see immediately that he was head and shoulders above the rest. He already knew how to do everything with a ball." It was more for his physical attributes that local professional club Lens were first alerted to Gbamin. After his step-father had rejected an approach 12 months earlier, he eventually joined the former Ligue 1 champions in 2007, playing in their colours at the same time as Raphael Varane before he was lured to Real Madrid by Zinedine Zidane. Though the former Paris Saint-Germain and Aberdeen defender did not hand Gbamin his first-team debut, he undoubtedly played a major role in chiselling the sharp edges off his rough diamond. Uncompromising as a player and no less forgiving in the dug-out, Kombouare kept his tempestuous young charge in line, and came down heavily when he failed to toe it. When Gbamin was caught speeding with then-team-mate Wylan Cyprien when the pair were 19 and had their driving licences confiscated by police, the first-team axe fell with the zeal of a French revolutionary before Kombouare brought Gbamin back, taking him under his wing, both protector and potential prosecutor. "I love to give everything," said Gbamin at the time. "If the coach has faith in me, it's because I've done things to earn it. It's up to me to repay it. He has his principles with the youngsters. He teaches us respect." That is not to say Gbamin does not overstep the mark still. Three red cards in his first season in Germany, including back-to-back dismissals on Matchday 12 and 14, are testament to a fiery, competitive edge that can skew his better judgement. Just two yellow cards in the remainder of the Bundesliga season — and none in the higher tempo, inflated pressure atmosphere of the UEFA Europa League — suggest that such moments of madness are limited and will decrease with greater maturity. The ability to keep his inner lion in its cage will also be enhanced as his international career progresses. After playing alongside Manchester United's Anthony Martial, Athletic Bilbao's star defender Aymeric Laporte and highly-promising PSG midfielder Adrien Rabiot in the France Under-19 side that finished runners-up at EURO 2013, and then graduating to the Under-21s, Gbamin's development in Germany has opened new horizons. The appointment of the enterprising Marc Wilmots as Ivory Coast boss led to the Mainz man declaring he will play his senior international football for the west African nation, joining a swathe of fellow bi-nationals that promise to successfully build on the legacy of the side that won the Africa Cup of Nations in 2015. Like the Elephants, Mainz will also require Gbamin to maintain the upward trajectory he has had in his career so far to ensure the 2017/18 Bundesliga season is to be enjoyed and not endured.